Morrone Walk, Braemar, Deeside , Grampian mountains, Chapel Brae, Cairngorms. 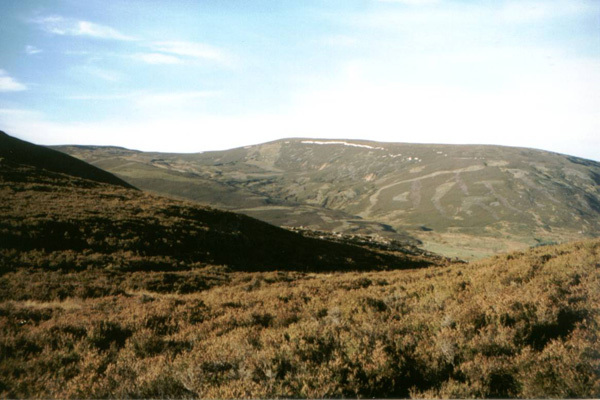 Rising south from Braemar, Morrone is a Corbett enjoying spectacular views over Deeside and the Grampian mountains. The name translates from the Gaelic as 'big nose' and this is a fairly apt description of this prominent peak's profile. Set off from the car park at the top of Chapel Brae and head south west along a track. A short way on, at a junction, turn left and follow the track south up into the Morrone Birkwood Nature Reserve, one of the finest examples of upland birchwood in Britain. Pass a house on the left and climb through birch and juniper to a viewpoint where a plaque identifies surrounding hills. Nearby a small cairn has information on the nature reserve and to the left of this there is a marker post with 'Morrone' etched on it. A path strikes out over open hillside, climbing to a deer fence. Rather than a gate or stile there's a wooden passageway through the fence which deer cannot negotiate. Go through and the ascent proper begins, the path rising to a line of cairns at an altitude of around 2460 feet. The top is still a little way off but the cairns mark the start of a more gradual climb. There are excellent views north over Braemar to the high peaks of the Cairngorms. As you gain height the heather thins out to reveal more stony ground and soon a large aerial mounted on the summit of Morrone looms into view. The top stands at 2815 feet and in addition to the mast, there is a trig point and a large cairn. Continue the walk from the summit by descending south on a wide track that drops into Glen Clunie. This meets a minor tarmac road at the fall floor, opposite Auchallater Farm. Turn left and walk north, the route following the Clunie Water towards Braemar Golf Club. Just beyond the clubhouse, on the left-hand side of the road, there is a wooden marker post with a blue strip painted on it. Leave the road here, turn left and follow a path up towards several static caravans perched on the hillside. Behind them, a stile crosses a fence and once over this you're back in woodland. The path is indistinct through the trees but you should head diagonally right up to the top where another wooden 'gateway' passes through a deer fence. The path skirts round woodland, bringing you back to the viewpoint. From here, retrace your steps the short distance to the car park. Start/parking Public car park at the top of Chapel Brae, Braemar (grid ref NO 143911). Grading A tough little climb to the summit of a Corbett. Track and path throughout with around a mile and a half of the final section on a quiet country road. Dogs on lead through the golf course towards the end.